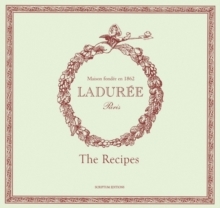 From biscuits to cakes, and from tarts to pastries, the classics of the House of Laduree are unveiled in this beautifully photographed collection of recipes. Even the world-famous macaroon reveals its secrets! Within these pages, you will find a tantalising array of refined flavours and enchanting colours: powder pink, vibrant lilac and Laduree's trademark pastel green ... where the delicious combines with the exquisite for the delight of all gourmets. The wonderful story of Laduree began in 1862, when Louis Ernest Laduree opened a bakery in the very heart of Paris at 16, rue Royale. During this era, the neighborhood surrounding the Madeleine was rapidly developing into one of the capital's most important and elegant business districts. The most prestigious artisans in French luxury goods had already taken up residence there. At the beginning of the 20th century, Jeanne Souchard, Ernest Laduree's wife, thought of combining distinct styles: the Parisian cafe and pastry shop. With this, one of the very first Parisian tea salons was born. It was in 1993 that this "sleeping beauty" with still untapped potential was taken over by David Holder and his father Francis Holder. With the opening of the Laduree restaurant and tea salon on the Champs Elysees in 1997, decorated by Jacques Garcia, this true institution became one of the top addresses for Parisian gourmandises. Boutiques in Printemps' Grand Magasin and on Paris' left bank followed, as did the beginning of the international adventure with openings in London, Geneva and Tokyo.